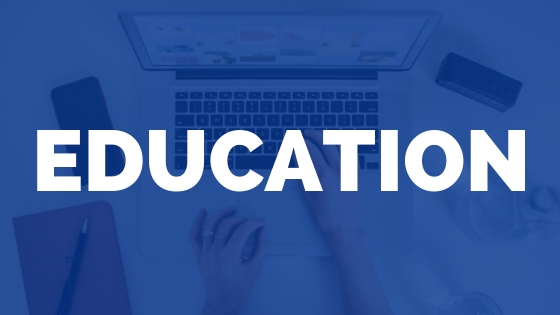 Poor posture and forward shoulders are almost always linked to a short pec minor muscle. 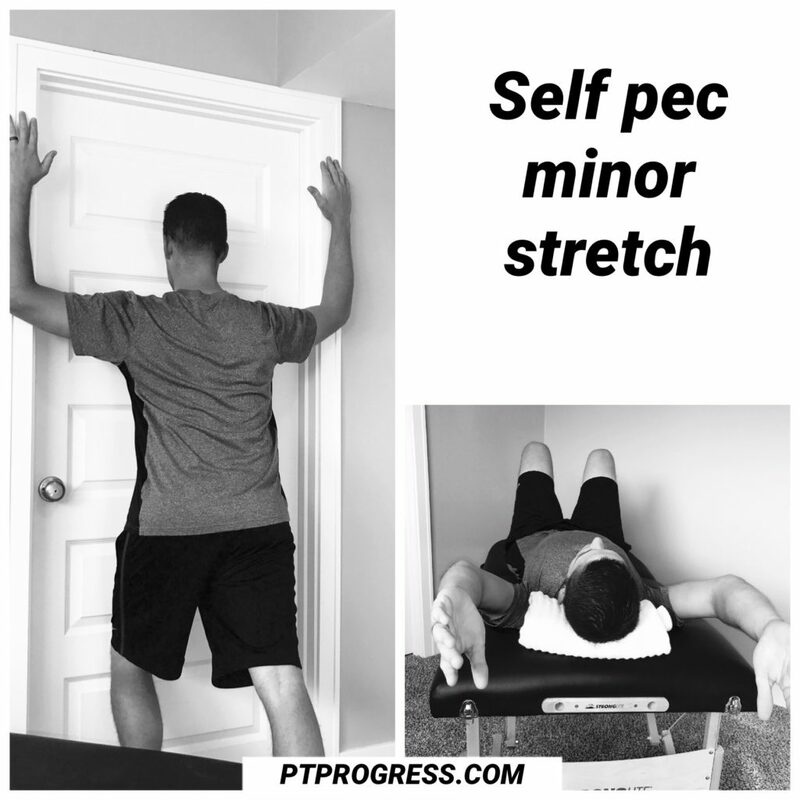 Pec minor stretches are often used in physical therapy to control the anterior or inferior pull of the scapula, which results in forward shoulders. The pectoralis minor action is to internally rotate and anteriorly tilt the scapula. It can also help with inspiration when the insertion (coracoid process) is fixed. This is achieved through stabilizing the arms on a high surface like a counter top. The pectoralis minor originates on the outer surfaces of ribs 3, 4, and 5 and from the fascia of the intercostal muscles. The muscle inserts on the coracoid process of the scapula. 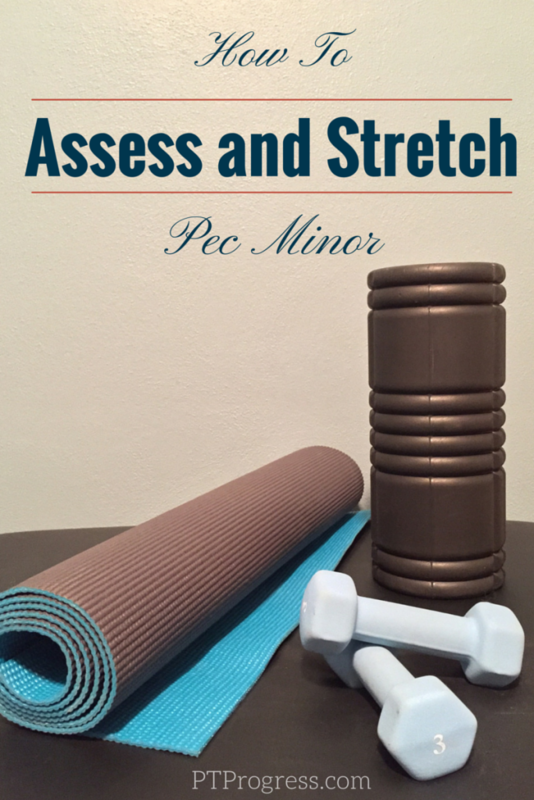 The proper position to assess the length of the pec minor is in supine (lying face up). Place towel rolls under the elbows and rest forearms on abdomen. Measure the distance from the acromion to the table. Normal is 1” from the table. Excessive is greater than 1” from the table. Stand at the side and place outer border of hands on the coracoid area. Press slightly towards the table, carefully noting discomfort or stretch. Monitor the trunk and rib cage for elevation. If rib cage elevates, provide cue to contract abdominals to stabilize trunk. Start lying face up on surface with arms 90˚ to side and with elbows flexed to 90˚ – this should resemble a goal post sign. 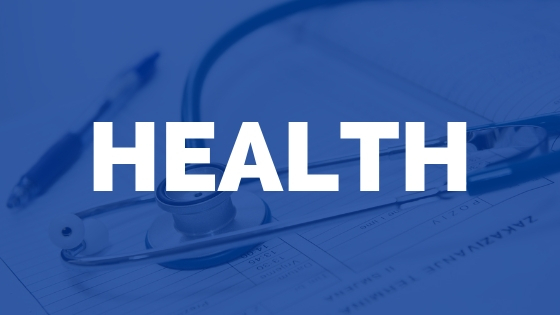 The head should be aligned so that a slight chin tuck is maintained through the next motion. Slide arms up the table towards your head, keeping the back flat on the table. Only move until a mild stretch is felt. Do not push through pain or push beyond a mild stretch. Breathe while holding the stretch for 10 seconds and return. Make sure to maintain slight chin tuck during the entire motion. Facing a door frame, place your arms along the frame as pictured above. Gently press in towards the door to feel a stretch along the inside of your arms. Hold the stretch for up to 20 seconds, repeating 3-4 times. 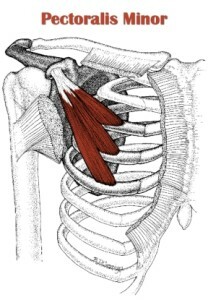 The pec minor is a key muscle in maintaining posture and scapular alignment. Properly stretching the pec minor can help with correcting forward shoulders, alleviate tightness in the chest, and to strengthen the back muscles which may be lengthened due to the shortened position of the pec minor. What pec stretches would you add to this list? Leave a comment to share your best pec stretch tips.